Two brand-new family attractions — Gilbert’s Maze and the Dragons’ Lair — have today (23 August) been unveiled at Caerphilly Castle. Designed as part of Cadw’s Castles Alive! campaign, the much-anticipated attractions are now officially open to the public, marking the completion of a project to transform the site into a major UK tourist destination. Gilbert’s Maze, which was designed by the specialists behind interpretation at The London Dungeon and Madame Tussauds, invites daring knights to conquer the Castle’s unique defensive system by navigating hidden passageways and challenging obstacles — all without getting caught by its 13th century owner, Gilbert de Clare. Meanwhile, the mystical Dragons’ Lair will be a permanent home for the Cadw Dragon family, promising to delight visitors with a full audio-visual display, with smoke, snores and a magical reading of the Dragons’ epic tale available at the touch of a button. The new attractions — which were meticulously designed, built and installed over a period of eight months — are accompanied by a complete re-brand of the 750-year-old site and an array of exciting historic events and onsite activities for visitors to enjoy, from digital dragon spotting with the Little Dragons app to the Castle’s popular treasure trail, Castle Quest. Castle visitors will also be able to meet the ‘real’ Gilbert De Clare every day through August — courtesy of Past Pleasures, the historic interpretation experts known for their work at world-class sites such as Warwick Castle and the Tower of London. 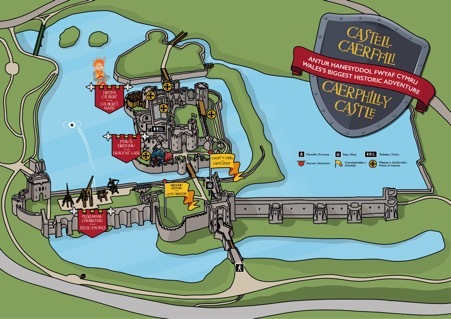 Furthermore, after months of restoration and training a team in medieval warfare, visitors can soon expect to see regular live shows where 12th century-inspired Siege Engines will catapult ammunition high above the castle grounds, travelling an impressive 150ft across the spectacular medieval backdrop into the surrounding moat. The new attractions are part of a wider £9.5m Welsh Government investment over the next three years, which will enhance the visitor experience at historic sites across Wales — including further investment in the Caerphilly Castle Masterplan and new interpretation at Caernarfon Castle, which recently became home to holographic dragon game, Legends of the Sky. Minister for Culture, Tourism and Sport, Lord Elis-Thomas, said: “The unveiling of Gilberts’ Maze and the Dragons’ Lair at Caerphilly Castle marks a brilliant new chapter in our efforts to bring new experiences and interpretation to Wales’s historic monuments — and where better to start than at Wales’s biggest castle, Caerphilly? “I’m confident that, with the help of the £9.5m investment, we can continue to capture the imagination of visitors from Wales and beyond by improving their experience at sites across the country. “Paying visitors to Cadw sites have risen dramatically in recent years, with an increase of almost 20% between 2016 and 2017 alone — largely thanks to crowds who flocked to meet the famous Cadw Dragon family. To keep up to date with Cadw’s Castle’s Alive! campaign and the full events programme at Cadw sites during 2018, visit www.cadw.wales.gov.uk, follow @CadwWales or @CadwCymru on Twitter and find Cadw on Facebook.